On behalf of the Hartford Area Chamber of Commerce, we are proud to bring you this Community Profile. You will find that Hartford has many opportunities and activities nestled into a quaint country-style setting. The uniqueness of Hartford begins with the downtown section. Specialty stores and shops located in restored buildings from the early 1900's attract customers from all over the state and beyond. Additional quality retail stores located throughout the community help to make Hartford a very convenient city. Just a short distance from the downtown, you will find well maintained industrial parks that are filling up with new and current businesses that see the advantages of being located in this community. And, throughout the area, you will find new housing developments that offer affordable housing as well as condominiums for the retired citizens. Add to this mix several beautifUl public parks, an excellent school system recreational activities for all ages and you can see why Hartford is a great place to be! The story of Hartford began in 1866 when William Benjamin Place, a Civil War veteran, founded the community. Place established a tannery, and W.B. Place & Co. still specializes in hand-crafted leather goods. A Buckskinners Encampment takes place in September every year and re-enactors set up on the company grounds to give visitors a chance to experience a part of history for one week-end. Hartford is also known for the manufacture of the Kissel car, which was produced in the town in the early 1900's. A large collection of vintage Kissels and other historic autos are displayed in the Hartford Heritage Auto Museum. The Hartford Area Chamber of Commerce is proud to be a partner in the ongoing development of our community. We encourage you to sample some or all of our community and enjoy the area we proudly refer to as home11. A Delightful Place To Live! Yesterday, today, and tomorrow come together to make Hartford what it is, a reflective, dynamic, look-ahead community in rural Wisconsin, a few minutes northwest of the fringes of metropolitan Milwaukee. From its historic old homes, enchanting auto museum, and classic downtown business district to its sparkling new homes, multi-screen cinema, and expanding new commercial area, the city displays the rich flavors of times past, present, and future. The homes of Hartford also reflect the warmth that dwells within. Meticulously cared for, they show community pride and the satisfaction with life. Hartford lifestyles are broad in scope, varying from sparkling new executive-style homes to late 19th century Victorian mansions and from cozy midsize single family homes to collections of condominiums and rental apartments. The public and parochial schools of Hartford reach for excellence in all their aspects. Nearby institutions of higher learning, parts of Wisconsin's comprehensive technical college and university systems, assure easy access to continued education. The community lives close to great natural splendor such as Pike Lake, Pike Lake State Park, and the Kettle Moraine State Forest. Outdoor recreation is part of daily living for Hartford area families. Some 20 well-equipped city parks augment resident's recreational opportunities. Health care is assured. Hartford Memorial Hospital is affiliated with several clinics that provide medical services in neighboring communities. The recently constructed Lone Oak Health Center houses five affiliated heath care providers, all part of Horizon Ventures Limited. Hartford government responds to the needs of the community in a variety of ways, including providing low cost electricity, water, solid waste collection, and waste water treatment. It encourages economic expansion, providing incentives for new businesses and encouraging expansion of existing businesses. Without doubt, Hartford is a delightful place to live, work, play, and raise a family. In 1838, two years after the Wisconsin Territory was established, the boundaries of Washington county were set by surveyors, identifying it as "Town 10, Range 18 East." Potawatomi and Winnebago Indians, who had ceded their land in 1833 and moved west to the Mississippi River, had begun to filter back to their traditional hunting grounds. 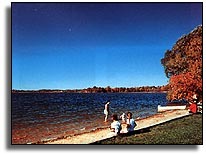 In 1843, some 100 Potawatomis lived on the east shore of Pike Lake and had friendly relations with the early settlers had come to the frontier from the east. By 1850, mass immigration from Ireland and central European nations was beginning. The Hartford area saw thousands of these hardworking settlers arrive in search of a new and better life, taking up homesteads and establishing businesses in Hartford and settlements like Germantown and Erin Township. Among them were John Thiel, from Germany, and Nicolas Simon, from Prussia, who arrived in 1844. History credits these two surveyors with being the first to plat what is now Hartford in 1844. Simon's description of the place he and Thiel had found attracted James and Charles Rossman who immediately purchased 40 acres around the rapids of the river that flowed through the area and constructed a dam. Later, the Rossman's built a grist mill. The settlement that grew around the dam and grist mill became known as Rubicon, after the river, but later Wayne, Benton, and Wright were considered as names for the community. In 1847, the name Hartford was chosen, it is said by the toss of coin, after Hartford, Connecticut. Hartford was incorporated as a village in 1871 and a dozen years later, with the population at 1,500, became a city. In 1866, William B. Place settled in the community and opened a tannery. W.B. Place & Company's tannery and retail store still sells quality leather goods. Each September, it holds its Rendezvous and Buckskinner's Encampment, an event that has become a major tourist attraction. The community's first school was established in 1845. A 19-year-old named Gad Root offered his services as a teacher and was hired at $14 per month. His first class had 25 pupils. The settlement's first organized church was the Congregational Church which held its first services in 1847. The congregation met in the school until 1853 when James and Charles Rossman donated a half-acre for the construction of a church building. By 1883, Hartford had two schools and six churches. Shortly after the turn of the century, the Kissel Motor Car Company was established in Hartford. Organized by Louis Kissel and his sons, the company built automobiles until the Great Depression hit the nation. In 1912, the company employed some 1,000 employees. Its two most famous vehicles were the 1919 Goldbug Speedster and the 1927 White Eagle. In 1931, the company was reorganized as Kissel Industries to build outboard motors for Sears, Roebuck and Company. It was later sold, first to West Bend Aluminum, then to Chrysler Corp.
Today, Hartford is a thriving community with a diverse collection of prosperous retail stores lining Main Street and an equally diverse industrial base, centered primarily in three large industrial parks on the city's west side. It preserves its history in several homes, buildings, and districts listed on the National Register of Historic Places and in museums like the Hartford Heritage Auto Museum where famous Wisconsin built cars, including the Kissel, are displayed. As the new millennium nears, the city proudly hails its past and looks with confidence to a bright future. 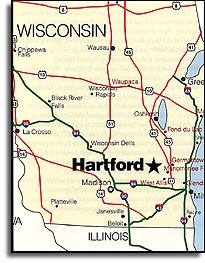 Hartford is situated northwest of Milwaukee, about 30 minutes from the metropolitan center. The city has easy access to U.S. Highway 41, a freeway six miles to the east that links with Interstate 94 just west of Milwaukee. State Highway 60, a four-lane divided route, ties the community with U.S. 41 and to neighboring communities to the west. North-south State Highway 83 also crosses through Hartford, intersecting with route 60 at the center of the community. A fine system of county highways (called "County Trunks") is another transportation asset the city enjoys. All these highways lead to primary Wisconsin vacation spots like nearby Kettle Moraine State Forest. Hartford area business and industry are served by 94 trucking and warehousing firms located in Washington County. In addition, the city is served by the Wisconsin and Southern Railroad. The Port of Milwaukee is 36 miles from Hartford, opening world markets to local manufacturers, via the St. Lawrence Seaway. Air travelers drive the 38 miles to General Mitchell International Airport on Milwaukee's south side. The airport is served by 19 international, national, and regional airlines that fly to more than 45 of the nation's metropolitan centers. Another 15 cargo airlines also fly out of Mitchell International. About five minutes north of Hartford is Hartford Municipal Airport, a facility with a 3,000-foot paved and lighted runway and a 2,000-foot grass runway. Gliders and ultra-lights based at the airport use the grass runway. In total, about 75 aircraft are based at the airport, several of them owned by local corporations. The airport provides complete service, from fuel and maintenance to hanger rentals, parking, and tie-down services. It also offers flight instruction. There's a local taxi service and area limousine services provide transportation to special events and to Mitchell International. In addition, the community has a local bus charter service for same-day trips to special events and points of interest. Hartford rubs shoulders with Pike Lake, Pike Lake State Park, and Wisconsin's northern Kettle Moraine Forest area, dazzling recreation assets that attract thousands of visitors annually. To these, the city adds interesting historical attractions, sophisticated downtown shopping, a myriad of fine restaurants, and a wide choice of accommodations, including a quaint bed and breakfast. Pike Lake State Park offers year around fun. In summer, families fill the park's 32-site campground to enjoy swimming along a 300-foot sandy beach and fishing on the lake. There are picnic sites and grills, a well-equipped playground, shelter buildings, and a large field for softball, volleyball, and other sports. A variety of panfish can be caught near the shores of the 522-acre lake, along with bass and northern pike. Walleyes are hooked in deeper waters. Pike Lake State Park covers nearly 680 acres. A great place to visit for nature lovers, the park has more than 200 different wildflowers blooming from spring through autumn. The park offers a nature trail that's about three-quarters of a mile in length, an eight-mile hiking trail, and an eight-mile groomed cross country ski trail. Glacial action created the area surrounding the park. A 1,350-foot-high glacial kame provides a spectacular view of the lake and the park's unique glacial topography. Nearby Kettle Moraine State Forest contains some 17,000 acres carved into natural wonders by retreating glaciers. At Kettle Moraine visitors can enjoy boating, fishing, camping, picnicking, swimming, and hiking along marked nature trails. Lake Michigan, a short 40-minute drive from Hartford, is also a source of pleasure for boating, sailing, swimming, and fishing for large game fish. Several summer resorts are located along the shoreline of Pike Lake and in the area, some offering camping and others providing rental cabins. Hartford is home to two excellent national motel chains, one local motel, and a bed and breakfast establishment. Eight other quality motels are located in the nearby area. More than 30 restaurants, ranging from fine dining to fast food, dot the city and the surrounding area. Several excellent family dining restaurants in downtown Hartford are among them. The Hartford area's glacially created landscape, with its sudden hills and narrow valleys, is perfect for housing. Nearly everyone who lives in the Hartford area has an unobstructed view. Around the fringes of the community, many hilltop homes look out over valleys to the horizon beyond. Many lucky owners have lakefront properties on Pike Lake, free to enjoy the recreational amenities the lake offers. Others, like those living in Lakeview Acres, have homes high on the hills that nearly surround the lake, giving them a spectacular view. Executive-style homes are frequently found in new and developing subdivisions around Hartford's perimeter. Westridge, on the city's west side, is one of these. Sparkling executive and midsize homes occupy large lots that overlook the city in one direction and a vast expanse of countryside in the other. Close to downtown, on North Main Street and its vicinity, are homes from the city's early years. Here are Victorian styles, painted ladies, Greek Revival, and Federal designs from the 19th century, Tudor, Cape Cod, bungalow, and American Foursquare styles from the early 20th century. All are meticulously maintained, giving a perfect picture of times gone by. New contemporary homes are found in subdivisions like Chapel Hill, and Park Knoll Estates. A splendid collection of new midsize and executive-style homes is located near Rossman Elementary School, overlooking Countryview Park, a wildlife and wetlands reserve, and farmland beyond. Prairie Crossing is another handsome new subdivision north of downtown. Fine, new executive-style homes are perched on a hilltop that overlooks the community's high school and its sports complex. The subdivision also offers duplexes and condominiums. Prairiestone, Hunters Ridge, Fox Haven, and Willow Glen are typical of the quality multi-family homes available to prospective residents. The latter two condominium complexes occupy a wooded area on the city's south side. In addition, Hunters Ridge offers an array of duplexes. Oakview Luxury Apartments, east of downtown, and other apartment complexes are available for those who prefer the freedom of rental occupancy.Of course, there are also opportunities to live along the Rubicon River or along the fairways of a fashionable golf course. Whatever the preferred lifestyle, There's a home in the Hartford area to match it and the allowable budget. Shopping in the Hartford area is an experience to be enjoyed. From the city's sophisticated downtown business district to shopping centers at the eastern edge of the community, all needs and desires are fulfilled. The center of the community is contained in a valley, making "downtown" an appropriate description. 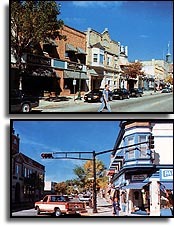 Like many communities, Main Street is the city's business street in the downtown. Much attention has been paid to details. Street lights are styled like the gas lamps of old. Old style benches are spotted here and there, surrounded by brick paving. The stores and boutiques along Main Street cover the gamut. For about three blocks Main Street is lined with stores selling fine jewelry, clothing for the family, shoes, furniture, antiques, pets and pet needs, arts and craft supplies, hobby supplies, gourmet coffee, and greeting cards and gifts. Several restaurants are also located in the downtown, including a fascinating family dining place with loads of interior character. Entrepreneurism is encouraged in the downtown area by a low cost revolving loan fund. East Sumner (State Highway 60) is also lined with commercial establishments and professional services, almost from its intersection with Main Street to the edge of town. The street has two major shopping centers. Hilldale Plaza has nine stores including a big supermarket. Outbuildings house a bank and two fast food restaurants. Bell Plaza features a major national discount chain and seven other stores. A restaurant occupies an outbuilding. The Hartford area is rich in antique shops, attracting browsers from far and wide. There's even an antique mall with some 30 dealers represented. In summer, homemakers find farm fresh produce and fruits in the downtown area's Johnson Street parking lot, site of a Farmer's Market. The market is open from the second Saturday of May through the third Saturday of November. About 20 minutes northeast of Hartford is the larger community of West Bend. Paradise Mall, on West Bend's southwest side, is anchored by two large department stores and more than 20 shops, boutiques, and services. The large regional malls of Milwaukee are also within easy reach for Hartford shoppers. Seven banks serve Hartford area residents, encouraging economic development and providing a strong economic foundation for the community.